Did you miss the podcast? Listen whenever you want! Pat Sloan and I go back a long way…she is super nice person and fun to hang out with…We are both blessed to be MODA designers and if you want to listen to our chat we had today we had lots to talk about. 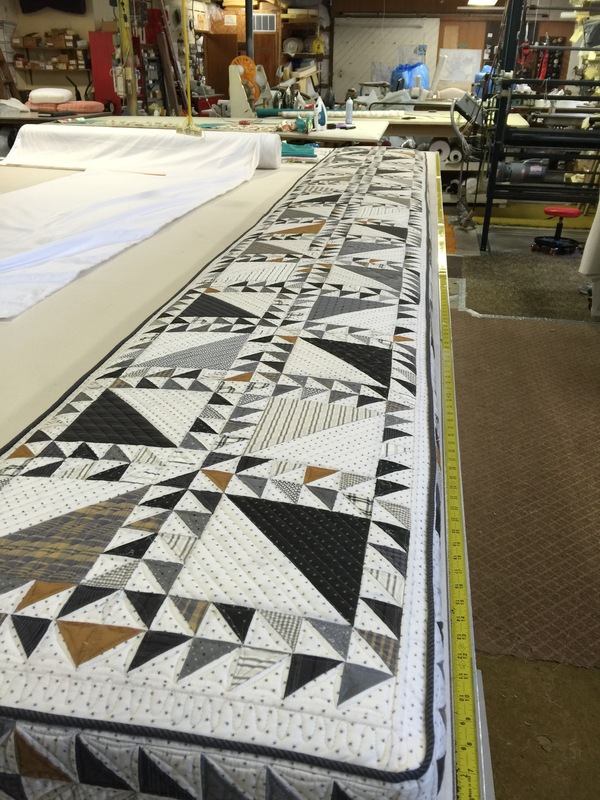 He loved the big window with the quilted bench pad…I made the long panels and Vegas Val quilted it and added some thoughtful touches… You can’t tell but the bench pad is 12 feet long!!! 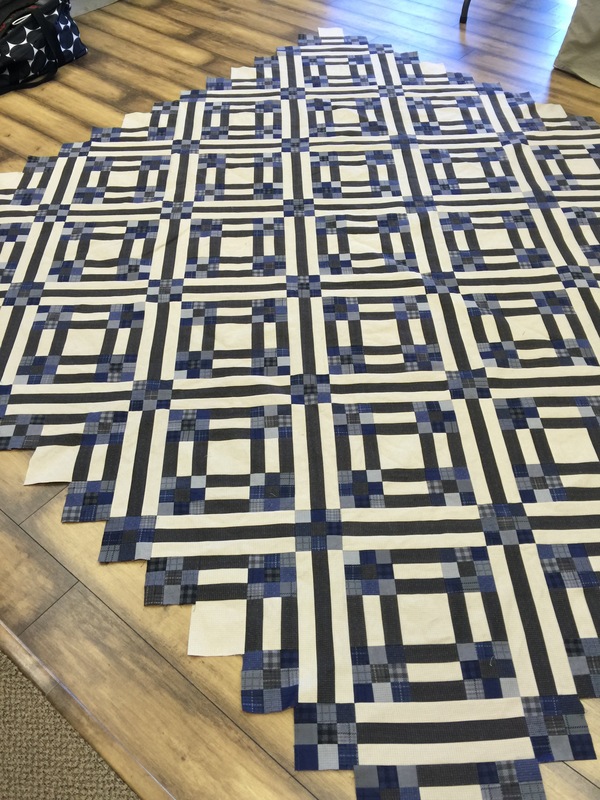 But I’m glad I took the time to do it…It adds a nice touch to the dining room….It is shown here where they converted my quilt “pieces” into the bench pad. Fockels Drapery which is conveniently located right across the street from my studio… I have all the book projects done…all the directions written…just waiting for a few quilts to come back from my A-mazing quilters!!! I’d be lost without Linda and Val. Book will be printed in the middle of this month! 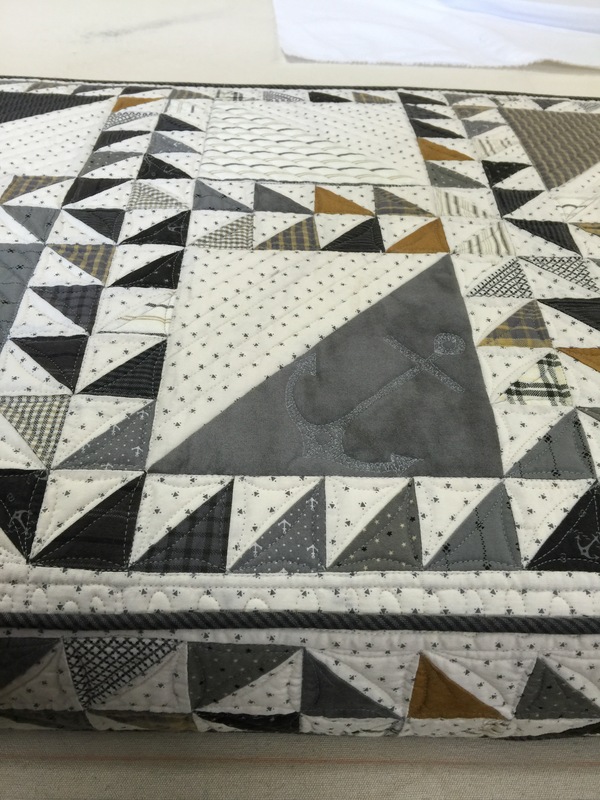 Thanks to all those Applique-ers who got these blocks back to me in a most timely manor…will do a post about this quilt after it comes back from Val. 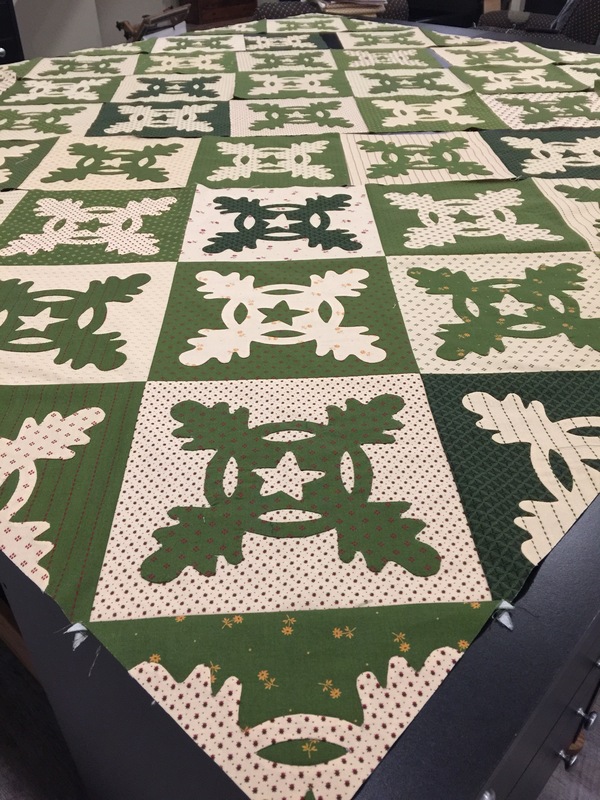 We also snuck in finishing 3 new quilts from The Farmer’s Son- Wool & Needle Flannel line coming in May..I cut out all the quilts, and only pieced on, Farmer’s Market, but Amy, aka the pressing Queen, got to stitch the other two while I was on the road teaching…I’m bummed because Crop Circles was super easy, … I love stitching super easy…then Heritage star is just an amazing quilt and very traditional but very current at the same time. 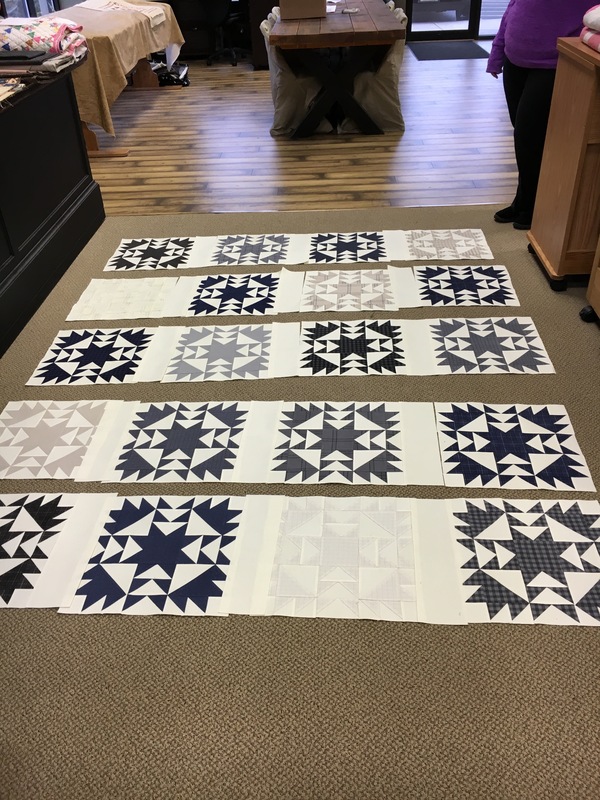 We will be getting these on the website soon…all these pics are “in progress” so will post again with finished quilted quilts!!! Will be back soon with more quilts and more house!!! 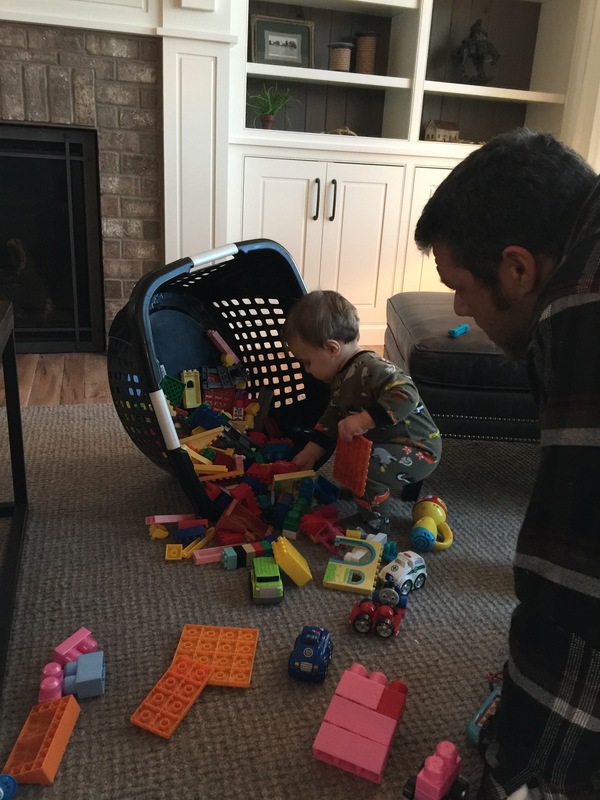 I’ll leave you with Big Papa and little man…playing in jammies!!! Oh my goodness I love this whole blog post Lisa!!! I don’t know where to start of course little man is just adorable I know you had to have a blast watching him this weekend 😃 Then you’re beautiful beautiful house it’s amazing I’m so happy for you and Nick and I’ll have to say the bench quilt pillow turned out absolutely awesome! I heard the podcast today and I was so excited about Farmers Son and now that I’m getting a sneak peek of It I can hardly wait for May to be here!!! what a fun time Lisa, thank you!!! 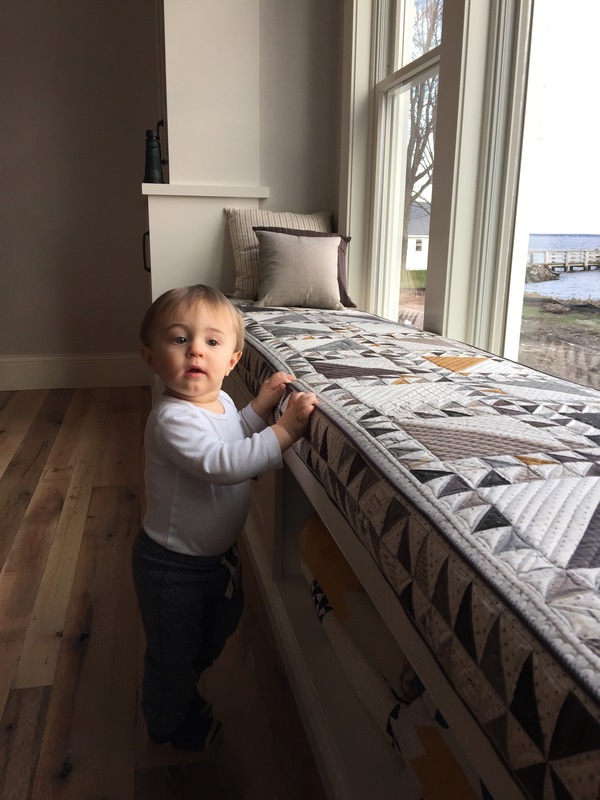 Little man is absolutely adorable, your home is awesome and the quilted bench is wow! Judy wow! Enjoyed listening to the podcast today! Love the pictures and looking forward to the new projects. Enjoy every moment with your grandson!! I listened live. You and Pat were great. This posting is fabulous. Love every single quilt. Can’t wait to see it all in person. Your home is fabulous. Love pictures of your grandson. So much joy. Hi to Eric too. Hoping to see you at Spring Market. Oh, I knew I was forgetting something today! I will have to listen later. Thanks for the link. 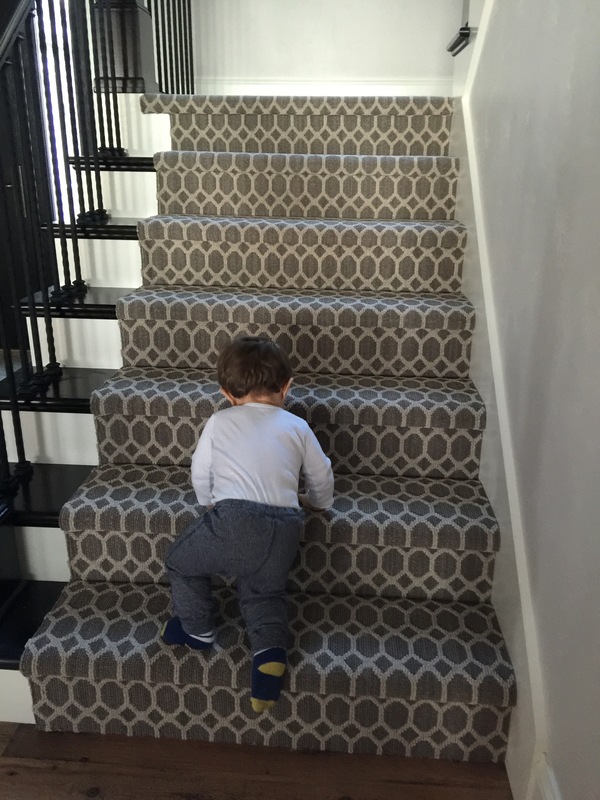 Love everything here–the house, Little Man, the quilts! I think my jaw hit the floor when I saw “Among Friends”!! Thank you so very much for posting pictures of your absolutely beautiful lake house! The bench cushion is lovely. Hope you’ll soon be all moved in and enjoying every square inch. Can’t believe how big “little man” is – so cute! 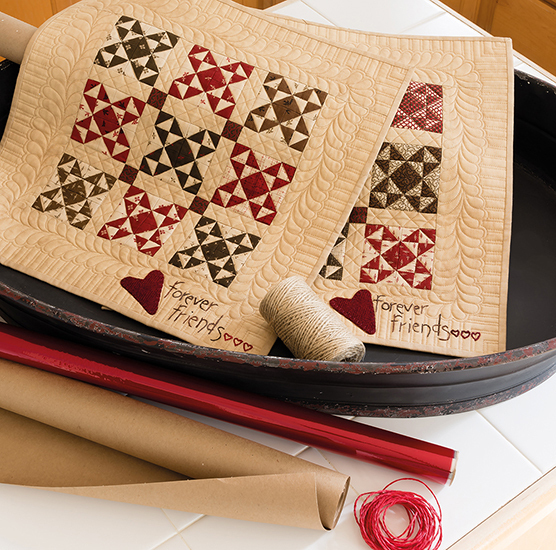 Love the quilt bench and the new things coming – can’t wait for the reveal of all things new! Thank you for the fun post! You gave us a taste of everything, quilts, lake house, and that adorable little boy. You have a wonderful, full life and this shows your hard work and talent! Lisa, your house and your family are beautiful! It amazes me all that you accomplish. It really does sound impossible. 🙂 I can’t wait to get my hands on your Farmer’s Son line. 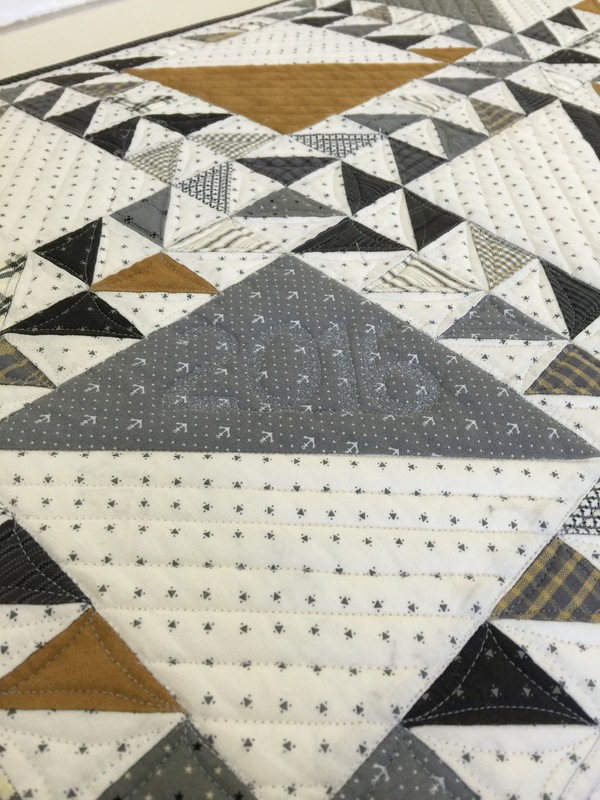 I love all three of the quilts you’ve shown. 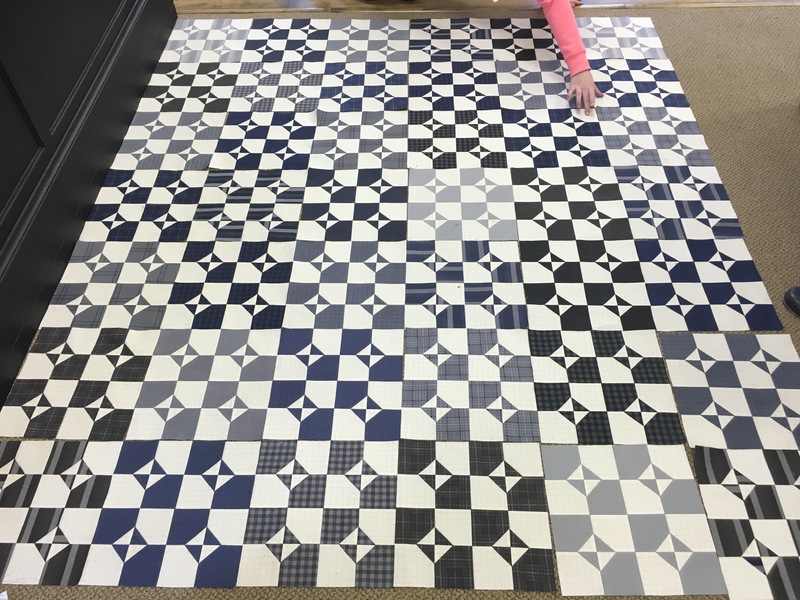 Could be that I’m a fan of blues and greys…..
What a wonderful post!!! First, the quilts are inspirational and second what a treat to share your beautiful home. So very happy for you all. So good to find this lovely, long post. Your little grandson is so darling. The new fabrics and designs are glorious! I appreciate all you do. Happy spring! 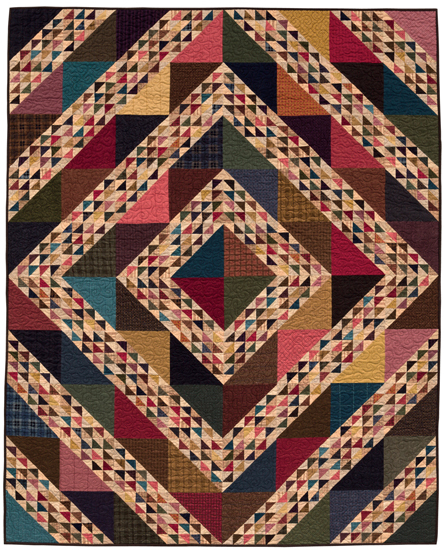 Quilts are absolutely amazing! So if the family! How adorable is your grandson!! I have been having baby time with my new granddaughter, 1 month old on Sunday. It is so special. 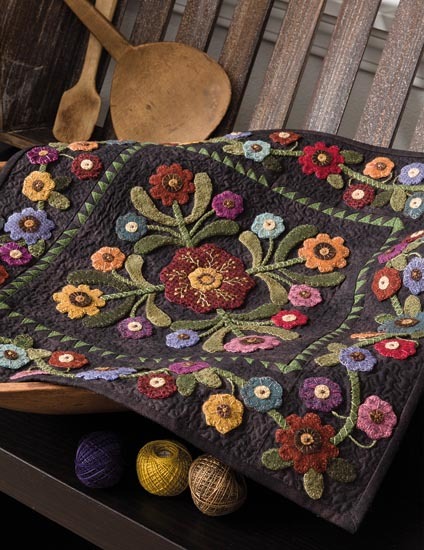 Your home and your quilts are amazing Can’t wait to see the book. 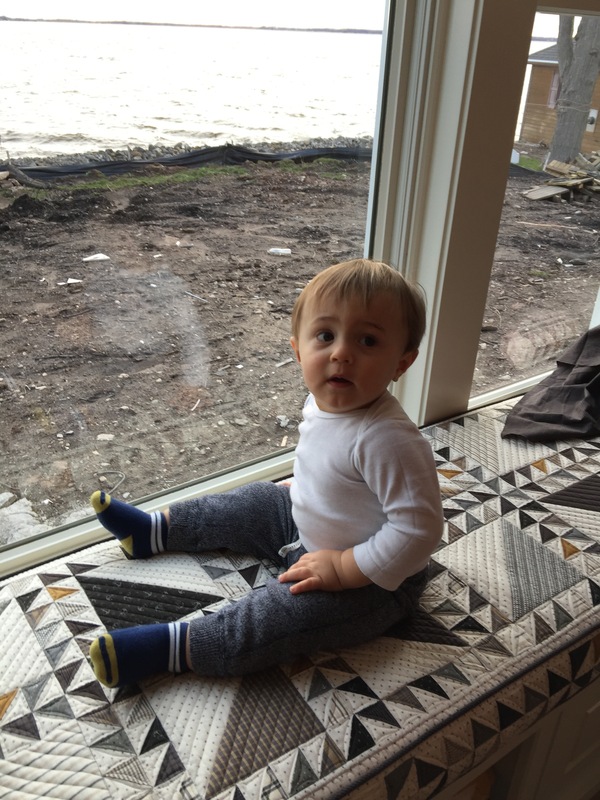 Thanks for sharing pictures of your grandson and your new home. Love your new quits and am looking forward for what is coming. Thanks, Lisa. Hi Lisa – When I see an email come through that you’ve posted something, I cannot wait to go out and look at it. 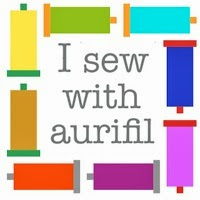 Just viewing the posts are so inspirational, I cannot wait to get home in my sewing room. You have a great talent and thank you always for sharing. 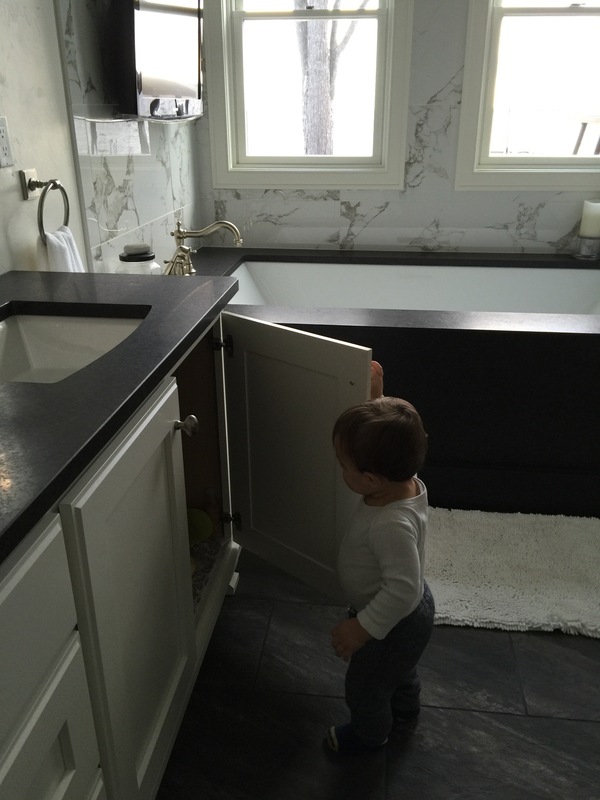 Thank you for sharing the photos of your handsome little grandson! I love your new home and the colors you have chosen, those grays and yellows! Your bench cover is actually quite awesome, what an amazing idea. You have such a talent and I am so glad you share with us. 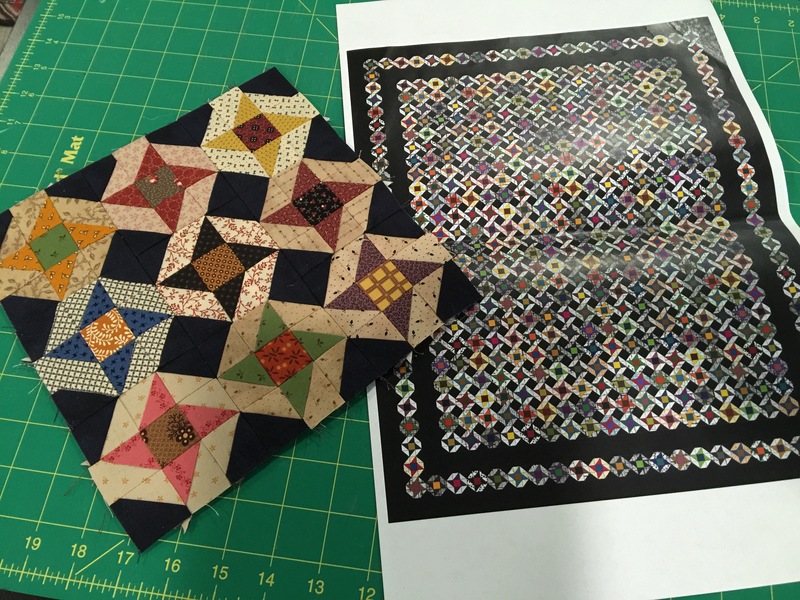 Your podcast was great, enjoyed hearing about the new quilts, and excited about your new book! I know you will be busy with Market coming up soon, and it will be fun to see what you share that is new! Thanks for shring your pictures of Lillte Man and of your beautiful home! Love your new line and am planning on doing Circle of Crops. Love it! 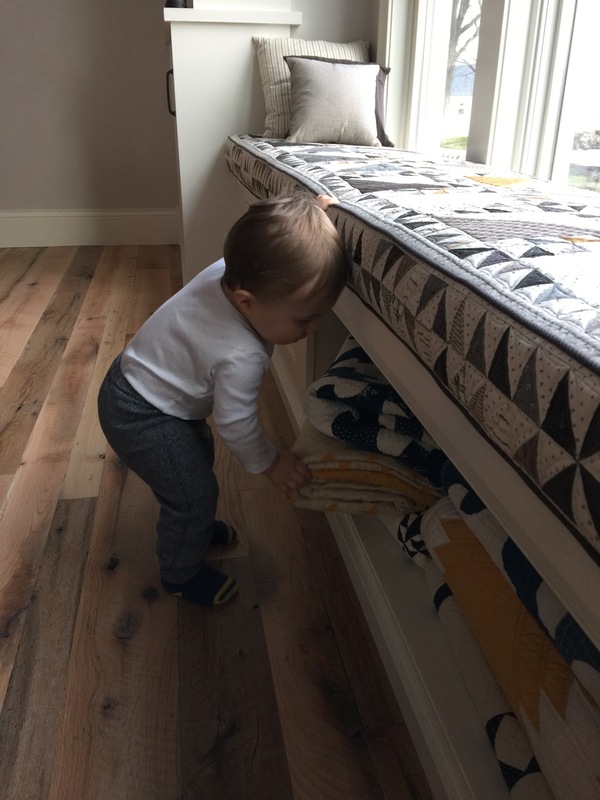 I love that little baby cutie taking the quilts out from the window seat !!!! !